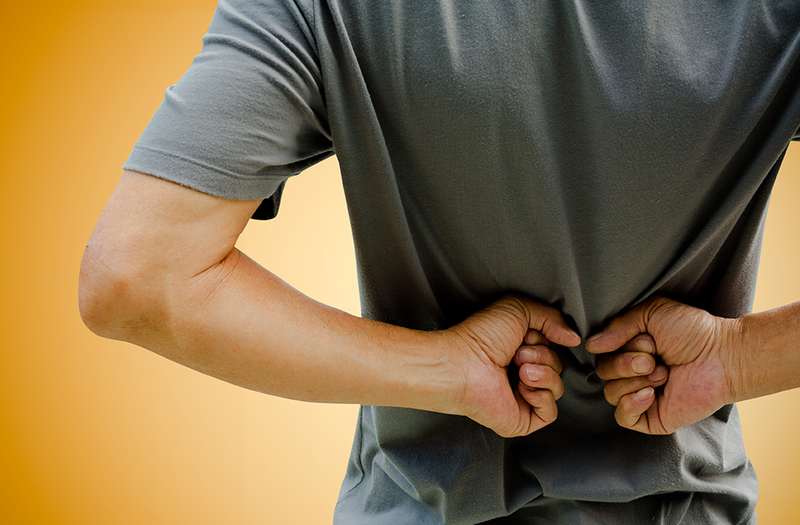 Approximately 80 per cent of people experience low back pain at some point in their lives. For most people, this pain will resolve on its own, thanks to a combination of the body's natural healing process and a return to regular activities. Unfortunately, some individuals may experience chronic low-back pain, which is defined as pain lasting longer than three months. This usually occurs when the acute injury has healed (soft tissue healing takes approximately four to six weeks), and the individual is left to deal with the residual effects of tissue adhesion, myofascial tension, and muscular weakness. The good news is that many of these factors are modifiable, with guidance from a physiotherapist who will encourage you to take an active role in your rehabilitation. In addition to providing you with exercises to promote postural awareness, a physiotherapist can also offer recommendations on ergonomics in the workplace, and provide education on other factors that may apply to you. So what can you do to manage low back pain? The most important thing is to simply keep moving. There may be stiffness and discomfort in the initial stages; however, movement within a tolerable and relatively pain-free range will help maintain mobility, and prevent stiffness, muscle atrophy, and instability. Moving can be as simple as walking or biking in bouts of five to ten minutes and is an essential component in your recovery and management of low back pain. It's also important to work on your core, hip, and back muscles. Core muscles help stabilize your trunk and low back, in turn contributing to proper posture, ease of movement and injury prevention. There are deep and superficial core muscles. The deeper core muscles are considered postural in nature and attach directly to the spine, affecting stability of the spine itself. The superficial muscles are more dynamic stabilizers and contribute to the control of trunk movements in order to protect the low back and pelvis from instability. Your core muscles are engaged not only during trunk movements but also during many functional movements of the arms and legs. Movements such as walking, jogging, running, or going up and down stairs will activate the core, back, and hip muscles. This co-contraction decreases pressure and stress on the low back. Engaging your core can be difficult, but it is important to practise and ensure appropriate posture during both exercise and daily activities. Jasmine Thorsteinson is a physiotherapist with the Reh-Fit Centre. Here are a couple of core-strengthening exercises that can help you get started on supporting your spine to prevent or manage low-back pain. Get down on all fours, placing your hands underneath your shoulders, and your knees underneath your hips. Make sure your pelvis is in a neutral position. When first trying the Bird Dog, you can do just arms or legs. Reach one arm forward and hold for two to three seconds, then return to the start position. Switch arms and repeat. Then do the same with your legs. Lift your leg and hold for two to three seconds. To increase the activity, do it with one arm and one leg, on opposite sides of your body. Hold for two to three seconds, and return to the start position. To perform the bridge, lie flat on your back with your feet hip-width apart and your knees bent. Hands are to your sides. Engage your core muscles (contract your abdominals and squeeze your bottom). Press your pelvis to the ceiling, to align your knees, hips and shoulders. Hold for two to three seconds, then return to the start position. To increase the activity, do a single leg bridge. Get into the bridge position, and raise one leg. Hold for two to three seconds, and then return to the start position. Change legs and repeat.